Click here to print. 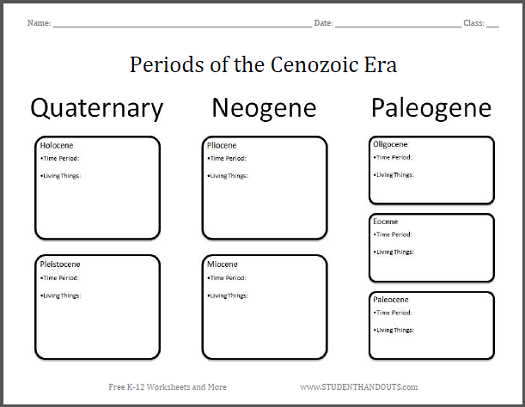 Students familiarize themselves with the timeline and genera of the Cenozoic Era by completing this chart worksheet. At the top are listed the three periods of the Cenozoic: Paleogene, Neogene, and Quaternary. Under these are listed each period's respective epochs (including our own, the Holocene). Students research the time period from each epoch, as well as genera (living things, such as plants and animals) that lived during the epoch. This is a fun and engaging way of familiarizing students with geological time periods, the evolution of plants and animals, and global prehistory, while meeting common core requirements for organizational and research skills. Possible point scale: Four points for each time period, and ten points for each list of living things (require five organisms at two points each, for example). This totals 98 points; you can throw in two points for neatness to total a hundred points. Extension Activity: Once the students have come up with a few dozen plants and animals, have each student select an organism to research. On a poster board or in an informational pamphlet, students present an image of the organism and basic facts. Students also report on whether or not the organism has living descendants or close relatives, and what they are.